Buy (used) From Amazon! Scholastic Book Club has purchased the rights to reprint, and I hope they will do so soon! 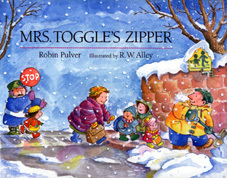 Poor Mrs. Toggle! She's trapped in the big, puffy, fuchsia-colored coat that she got for Christmas. The zipper is stuck, and what's worse, the thingamajig that pulls the zipper is missing. Everyone at school, from Mrs. Toggle's students to the nurse to the principal, tries to help the teacher out of her coat. With thuds, bumps, bangs, and kerplops, all end up on the floor. Finally, it's the custodian who saves the day by using a little common sense! -American Booksellers "Pick of the Lists"
-featured recommendation of Jim Trelease's "Read Aloud Handbook"
Children apreciate it when they see an adult struggling with a problem they sometimes have themselves. Who hasn't struggled with a stuck zipper? The principal (Mr. Stickler); the nurse (Mrs. Schott), and the custodian (Mr. Abel) all bring their expertise to the problem.